Balance work and life!, says Ganesha to charismatic Karisma Kapoor. Her intention of making a mark as an actress was clear, when, despite a strong opposition from the paternal side of her family, she debuted in a Hindi films as the female lead at the tender age of sixteen. The family in question was Indian film industry's legendary Kapoor family, and the lady to break a long-held family tradition was the blue-eyed, fair-skinned Karisma (then Karishma) Kapoor. Born to Raj Kapoor's elder son, actor Randhir Kapoor and yesteryears' gorgeous leading lady, Babita, Karisma is the fourth generation of the revered and established filmy clan. What's worth admiring is that Karisma, despite such a huge filmy background, chose to start off modestly with a modest-budget, no-frills Prem Qaidi. The journey thereon has been an eclectic one for Karisma. It's undeniable that she did manage to bring in a freshness to the then-stagnating Hindi actresses' slot. Yet, given her raw appeal and 'different' (albeit pretty) look and acting, she did have her fair share of critics. Once she paired up with Govinda and David Dhawan to make hits like Raja Babu, Coolie No. 1 and the likes, she didn't look back. However, blame it on the films she chose to be in or the general trend of the film industry that Lolo, as Karisma is fondly called, did get typecast as a glamour doll. And then, in 1996, she did Raja Hindustani opposite Aamir Khan. The movie took the box-office by storm. With it, she proved that acting indeed ran in her blood! The film also won her her first Filmfare award for the Best Actress. This success streak continued for her with films like Dil Toh Pagal Hai, which won her the National Award for Best Supporting Actress, Biwi No. 1, Haseena Maan Jayegi, and Hum Saath Saath Hai. Her portrayal of a distressed sister in Fiza, and of a a glamorous girl who falls for a crown prince that changes the course of life forever, won her a pat on the back from everyone! One to largely remain tight-lipped about her personal life, even after a very public engagement and consequent break-up with the Bachchan scion Abhishek Bachchan, Karisma got married to Delhi-based businessman and her childhood friend Sanjay Kapur in the year 2003. The grand wedding made national headlines, and the couple now has two cherubic children, girl Samaira and baby boy Kiaan. However, their marital life has often been in the news for all the wrong reasons, and they have been said to heading divorce/ separation. 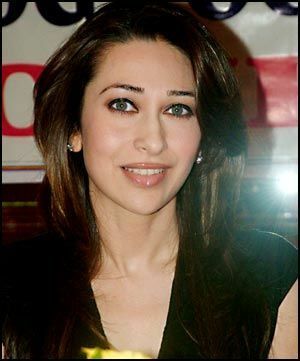 Resplendent and stylish, Karisma turns 38 on 25th June. She has been contemplating a comeback for quite a while now, and also recently appeared in the movie Dangerous Ishq. Ganesha, with the help of Vedic astrology, reads her Surya Kundali and makes some interesting observations about her life and future. Read on. 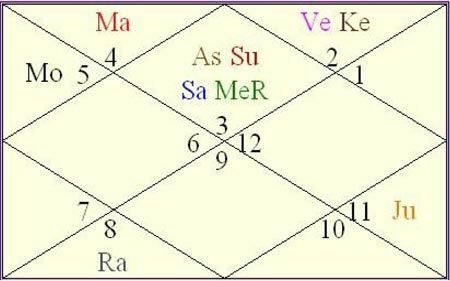 Ganesha observes that Karisma is born with Venus Ketu conjunction in Taurus. Venus in Taurus makes her a very good actress. It has also bestowed her with a resplendent beauty. Mars in Cancer indicates that she may not be able to take very bold decisions in her life, unless circumstances are very forceful and lead her to a juncture wherein she has no other option but to take a bold step. Saturn, Sun and retrograde Mercury in Gemini make her conscious of her public image, owing to which she may remain very careful, while giving an interview or while issuing a public statement. During the year ahead, she will be under the influence of Rahu Ketu half return. Ketu's transit over Venus will play an important role in her life, and may even bring a marked turning point. Transiting Saturn's Square with Natal Mars will also remain very vital for her. Jupiter's transit through Taurus, and later through Gemini will bring some positive changes too. Ganesha foresees Karisma starting something new, which may be creative, but not necessarily related to the film industry during the year ahead. She may get into something related to women like a jewellery line or fashion designing or the likes. This will happen while, Jupiter transits over her Natal Venus. At the same time, she may have to struggle at her film career that she has been trying to revive. Ganesha does foresee luck favouring her post December 2012 though. However till then, Ganesha doesn't expect a major hit or blockbuster from her. Her personal life may remain under dark clouds for most part of the year, and the time till December 2012 is very important for her personal life. The couple may also finally decide to part their ways. There may be legal issues too, feels Ganesha. Karisma may be doing away with some of her Karmic bonds, and shall also be developing new relations during the year ahead. Emotional disturbances and stress may impact her health adversely. She needs to take a good care of herself. In conclusion, it can be surmised that the year ahead is good only post December 2012 for Karisma's film career, while turbulence may be expected at personal front. Lord Ganesha bless Karisma Kapoor with a happy and successful life and career ahead.